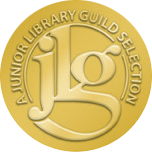 This medallion is awarded to books that are Junior Library Guild selections. The Junior Library Guild reads thousands of books each year and provides a prestigious national list recommending those books to libraries. Over 95 percent of JLG selections go on to receive awards and/or favorable reviews. Look inside the front flap of WILD AT HEART's cover and you'll see: "A Junior Library Guild Selection."